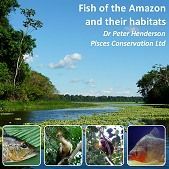 Fish of the Amazon and their Habitats: Peter Henderson / Pisces Conservation. This supersedes our multimedia CD "Amazonian Fishes and Their Habitats". Format: Multimedia CD-ROM, with web content, images and video.